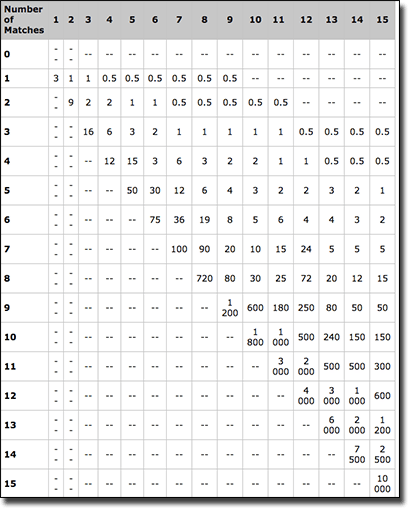 If you have ever frequented a pub, you most likely would have played keno – either by filling out a form from the little black container sitting in the middle of the table or via a machine. You may have noticed that there are an array of keno games available at online casinos, too. If you have avoided them because they look a bit different to the forms you play with at land-based venues you have come to right place. We have everything you need to know about playing keno online, where to play, and even tips to playing so you can learn how to play online easily, even if you’ve never played keno before. Keno can be considered bingo’s love child, as it’s often compared to its parent due to its lottery-like features, but seems to have a more modern edge. For those of you who have never played the game before, keno follows the same concept as land-based venues in that it involves players picking anywhere from one number right up to 15 numbers (with some titles having a maximum of 10 numbers only) out of 80 numbers or ‘spots’. 20 numbers are then drawn and the matching spots/numbers are paid out accordingly. We will go into more detail in our ‘how to play” section, below. Keno can actually have a very high house edge, but this is why we recommend playing it online over land-based venues. At pubs and RSLs, keno can have a house edge of anywhere from 20% right up to 35%, but online it’s generally 10% or less, so while the house edge is still high, it is a lot better than its land-based counterpart. Where did keno come from? It’s well documented keno originated from China. While legend has it that the game was used to fund the construction of the Great Wall of China, it can be confirmed that the first ever mention of keno was in 1847 in China. Instead of numbers however, players chose characters out of a Chinese poem called “The Thousand Character Classic,” and if they matched the characters drawn, they won. It wasn’t known as keno, rather the Chinese Lottery. The concept of the Chinese Lottery ventured with the Chinese as they immigrated around the world, including to Australia and the US. In the 1930’s in Nevada however, lotteries were illegal and therefore, the game was changed to Racehorse Keno so it could be played legally. With this, the game developed into keno and advanced to what it is known as today. Playing keno is incredibly easy regardless if you have played at a land-based venue or not. All standard online keno titles offer the usual 80 numbers to pick from in the game screen. Depending on what title you are playing will ultimately depend on the minimum and maximum spots you can choose but it’s generally one to 10, and sometimes one to 15. Simply click on the number on the screen to nominate your choice and continue to do so until you have chosen all your preferred amount of numbers or you’ve picked the max amount. You do need to pick your bet size and the payable in association to how many numbers you have picked will appear next to the grid. Then you simply press play, and 20 numbers will be drawn. Any matched numbers will generally change colour or light up on the grid. You can choose the pace when playing online, as it isn’t connected around the State like land-based keno is, and you don’t have to worry about getting your ticket checked if you win as you will be instantly paid, and can continue playing. The payouts ultimately depend on how many numbers you have picked. For example, if you pick three numbers and match three numbers it will pay 16:1 but if you pick six numbers and only three are matched it will pay 2:1. Another example is if you pick five numbers and match five you will be paid 50:1 but if you pick 10 numbers and only match five you will be paid 2:1 again. View the paytable to see how the payouts are affected when you pick different amount of numbers. Bet size: Your bet size will also obviously have an affect on how much you win. Many online titles have a fairly low minimum bet size of anywhere form 0.01 to $1 while maximums can range from $10 right up to $200 and more. With keno there are two sides to creating the perfect strategy. On one hand, the more numbers you bet on the more likely you will get matches, but on the other hand the less numbers you pick and get right the bigger the payout, as mentioned above. The maximum payout for a title that allows players to pick up to 15 numbers is 10,000:1, but it isn’t very likely that this will happen. Therefore you need to to get a balance in terms of the odds and how many numbers you want to pick. When it comes to picking the numbers, every number has an equal chance of being picked just as they do in the lottery, so you can pick whichever number/s you like. We have a few keno titles to get you started, with a standard keno title and two unique variants we recommend to try. Keno: This is a standard Keno title, by Microgaming, and is probably the best option to start with online. Players pick up to 15 numbers from 80, with 20 being drawn when you press play. Any matching numbers will turn red/orange. There is a minimum bet of $1 and a maximum of $10. 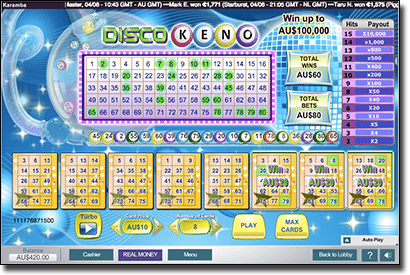 Disco Keno: If you are making the transition from bingo to keno then you should opt for Disco Keno, by NeoGames. It is a hybrid of both keno and bingo. There are up to eight cards available to play and the standard 80 numbers that 20 numbers are drawn from. Each card has 15 numbers on it and you need at least one card with two matching numbers to win. Minimum bet is $0.25 while the maximum bet is $10. Keno Kickoff: Once you know how to play keno it might be a good idea to branch out and play a variant. Keno Kickoff is a fun keno variant by 1×2 Gaming, which sees a 40 numbered grid (instead of 80) on a soccer field. Players pick up to 10 numbers and 10 numbers are drawn with a soccer ball landing on the numbered spots. The minimum bet is $0.05, while the maximum bet is $20.